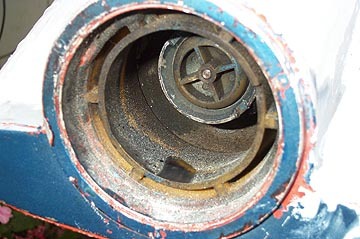 The intake to the jet board enclosed propeller is in the underside of the board just behind where the motor sits. 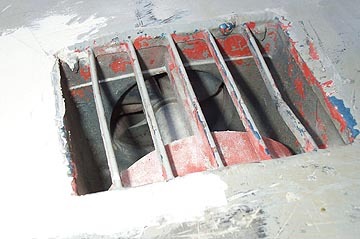 It has a basic grate to stop large objects (like hands) getting sucked in, and the propeller is a very tight fit within the start of the tunnel. 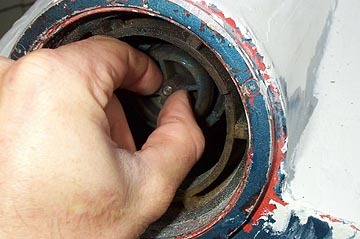 This can be a problem if you get a larger piece of sand stuck between the edge and the propeller. Here's a shot from the inside looking down into the jet tunnel before we cleaned it out. You can see the start of the exhaust to the right which runs parallel to the tunnel and then turns an exits through the center of the jet tunnel at the rear. Surprisingly there is no bearing where the propeller shaft hits the board body. There is just a small diameter locating point so we smeared it with grease and hoped for the best. Another interesting thing about the Jet Board is the spring loaded exhaust valve. The exhaust sits almost horizontally in the board and if there was no valve it would be easy for water to make its way back into the cylinder when the board is not running, which could damage the engine or at least make it very hard to start. This valve was stuck on ours, and after hours of pull starting the engine and wondering why it wouldn't start, we remembered this valve, freed it up, and the engine started right away. Basically the spring is strong enough to hold the valve closed but when the engine is running it is not strong enough to keep it closed against the exhaust pressure. 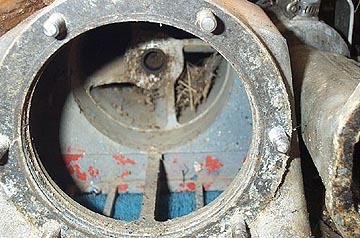 Although it is hard to see, here's a shot of the valve in the open position.